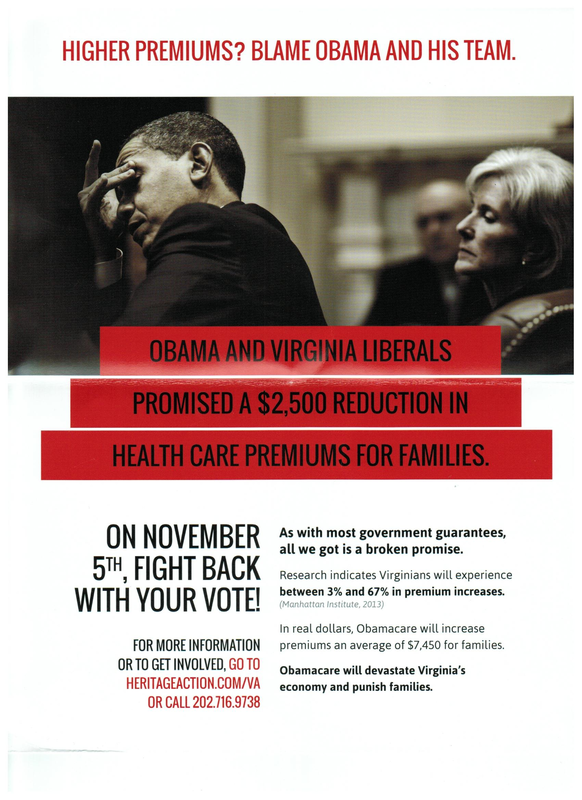 In a mailer to Virginia voters, the conservative Heritage Action calls out President Obama for breaking his promise to save families up to $2,500 in premiums per year under his health care overhaul. But the group makes its own misleading claims about premiums in the process. The mailer falsely claims “Obamacare will increase premiums an average of $7,450 for families.” That’s the increase in national health care spending attributable to the law for every four people over nine years — as 30 million uninsured Americans gain coverage. It’s not an average annual premium increase. The mailer also wrongly says “Virginians will experience between 3% and 67% in premium increases.” The study it cites actually said premium changes would range from a decrease of 19 percent to an increase of 67 percent. And the estimates are only for the individual market, where 5 percent of Virginians buy insurance, and do not account for subsidies that many will receive. Heritage Action, a 501(c)4 arm of the conservative Heritage Foundation think tank, starts off by saying, “Obama and Virginia liberals promised a $2,500 reduction in health care premiums for families.” And it goes on to falsely say: “In real dollars, Obamacare will increase premiums an average of $7,450 for families.” That figure comes from a Forbes contributor who calculated the per-capita amount of the increase in health care spending over nine years because of the Affordable Care Act and then multiplied it by four. All of those points are made clear by the Forbes contributor who calculated the $7,450 number. Forbes contributor Chris Conover, a research scholar at the Center for Health Policy & Inequalities Research at Duke University and an adjunct scholar at the conservative American Enterprise Institute, debunked Obama’s campaign promise in a September opinion piece by pointing out that the Centers for Medicare & Medicaid Services estimated that the Affordable Care Act would increase total national health care expenditures from 2012 to 2022 by about $621 billion. CMS, National Health Expenditure Projections, 2012-2022: By 2022, the ACA is projected to reduce the number of uninsured people by 30 million, add approximately 0.1 percentage-point to average annual health spending growth over the full projection period, and increase cumulative health spending by roughly $621 billion. National health expenditures include all national spending, from individuals, the government, businesses and insurers. Conover took CMS’ projected increase in national spending due to the ACA for 2014 to 2022, divided that by the projected U.S. population and then multiplied by four to get $7,450. That would be roughly $828 per every four people in the U.S. per year. Obama was talking about a reduction in health care spending compared with what would have happened without his health plan — not a straight reduction, though he didn’t explain that in his comments. CMS doesn’t expect that to happen through 2022. But that’s no justification for Heritage Action to foist more misleading claims on Virginia voters. Just as the president’s figure includes indirect savings, Conover’s $7,450 figure includes indirect costs, spending by businesses and insurers that are ultimately passed down to Americans in some form. Conover never presented the figure as an estimate on premium costs, as the mailer claims. Heritage’s wording leaves the impression that families with insurance now would pay $7,450 more in premiums. That’s not the case at all. We have no argument with that last point, but we’d offer there are accurate ways of doing so. The $7,450 figure is spreading. An ad from Republican Ken Cuccinelli in the Virginia governor’s race says that “his opponent, Terry McAuliffe supported the Affordable Care Act, “costing middle class families thousands” as a graphic is shown saying “$7,450 for a typical family.” But there’s nothing “typical” about lumping together every four people in the U.S. Similarly, in an ad released this week attacking Democratic Sen. Mary Landrieu of Louisiana, the conservative group Americans for Prosperity said “Obamacare will increase health spending by $6,777 for a typical family of four,” which is the $7,450 number in today’s dollars. Neither of these ads gives any time frame for this increase, nor do they mention Obama’s savings claim. Conover used the word “typical,” mimicking the president’s wording in his 2008 campaign promise. Readers of the column would know that. But viewers of these ads wouldn’t. Instead, they may think a “typical family” is one that has insurance, and has it through an employer, since that’s where 56 percent of non-elderly Americans get their health care coverage. The vague “typical” is like the label “middle class,” which is also used in the Cuccinelli ad. Most Americans think they are middle class, as we explained before, and politicians often use the term, without defining it. Readers of Conover’s column can understand why and how he uses the $7,450 figure and draw their own conclusions from it, knowing that this nine-year average would mean more spending for some and less for others, as 30 million of the uninsured gain coverage. But these political messages strip the figure of that context, and, in the case of the Heritage Action mailer, wrongly call it a premium increase to boot. “It doesn’t say much to say that total health care expenditures are going to grow — when adding 30 million more people,” he added. The Heritage Action mailer also says: “Research indicates Virginians will experience between 3% and 67% in premium increases.” It attributed the numbers to the Manhattan Institute, a conservative think tank, which did an analysis of premiums under the Affordable Care Act. But Heritage Action misquotes the study, which actually said the premium change would range from a decrease of 19 percent in price to an increase of 67 percent. Plus, the mailer neglects to say the analysis was only about premiums on the individual market — where about 418,000 Virginians, 5 percent of the state’s population, now purchase their own insurance, according to numbers from the Kaiser Family Foundation. The Manhattan Institute report compared the lowest cost premiums on the individual market before the exchanges, adjusted for preexisting condition denials or rate hikes, in each state to the lowest cost premiums on the new exchanges. The methodology explains that it included the five least expensive plans on a county basis before the law took effect and those now being sold on statewide exchanges, excluding catastrophic plans, for 27-, 40- and 64-year-old males and females who don’t smoke. The institute didn’t adjust the level of benefits or coverage of these plans. As we’ve said before, the law requires certain minimum benefits, which many individual market plans don’t meet. Not everyone will take advantage of, or welcome, those expanded benefits, of course, and the study was looking only at the cheapest plans available on the market before and after these regulations kicked in and the exchanges opened. Using that methodology, it calculated a wide-range of premium changes on the individual market in Virginia — from a 67 percent increase in premiums for 27-year-old males to a 19 percent decrease for males aged 64. It didn’t include premiums for catastrophic plans, which could offer a cheaper option to those 27-year-olds. Those under age 30 can purchase catastrophic plans, which cover less than 60 percent of the average cost of health care, but these young adults won’t be eligible for subsidies if they choose such a plan. The lowest cost catastrophic plan we found on HealthCare.gov for a young person living in Fairfax County, Va., outside of Washington, D.C., was $123.93 per month, for example. That’s $58 less than the average of the five lowest cost state plans, $182, as calculated by the Manhattan Institute without catastrophic plans. But it’s higher than the average of the five lowest cost plans before the Affordable Care Act, $109. The figures used in the Heritage Action mailer also don’t account for subsidies, which the Manhattan Institute estimates will be available to 51 percent of uninsured Virginians, or 606,000 people. Subsidies are available to those earning up to 400 percent of the federal poverty level, which is nearly $46,000 for a single person and about $94,000 for a family of four. We don’t know what percentage of Virginians who currently buy their own insurance would be eligible for subsidies. The Congressional Budget Office estimated that about 80 percent of all those buying exchange plans would qualify for subsidies. As we’ve said several times, some Americans will pay more, some will pay less, depending on several individual factors, including age, health status and where they live. Experts have long said younger, healthier Americans would likely pay more on the individual market, while older or less healthy folks would pay less. And the study supports that. Again, we wouldn’t fault Heritage Action for criticizing Obama for having promised a premium decrease of $2,500 per family. We’ve done it plenty of times ourselves. But the group attempts a fight-fire-with-fire tactic that presents more spin to voters.